The Lowrance Elite5x HDI is a fine example of Lowrance craftsmanship, combining the acclaimed Broadband Sounder and DownScan Imaging for double the fish-finding performance. It has an internal GPS antenna for chartplotting, which includes a detailed U.S. map for good measure. 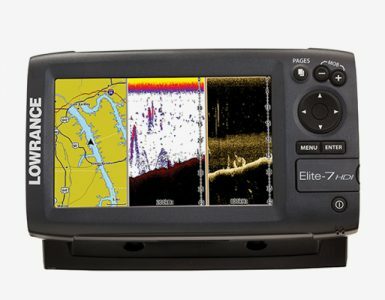 The two-in-one Lowrance Elite5x fish finder also comes with several features for added efficiency and convenience, from its high-resolution 5-inch color display with multiple view down to the Advanced Signal Processing and Trackback technologies. The fishfinder and chartplotter combo is equipped with the company’s new Hybrid Dual Imaging that combines the award-winning Broadband Sounder and DownScan Imaging technologies into one compact device. Built into the skimmer transducer, the Broadband Sounder makes it easier to mark fish arches and track lure actions while the Downscan Imaging system provides lifelike images of structure and bottom details. There is also the Downscan Overlay that layers the images from the two technologies together to expose a clearer underwater view that separates your prey from the surrounding structure. The Downscan Imaging has a depth capacity of 300 feet deep while the Broadband Sounder can reach a maximum depth of 2,500 feet. The Lowrance Elite5 x HDI has a built-in GPS antenna that will accurately mark your position on the included U.S map that features more than 3,000 rivers and lakes, including shoreline details and depth contours, along with coastal contours up to 1,000 feet deep. 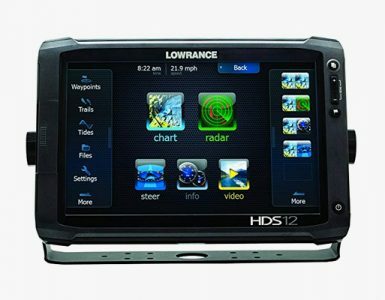 Aside from these, there are a number of other charting options available for the device, including Navionics Gold, Hotmaps Premium, Fishing Hotspots PRO, Nautic Insight Pro, and Lowrance Lake Insight. The company also threw-in their Insight Genesis Mapping system which comes handy when you’re in a fishing ground that doesn’t have a thorough map. This will let you make your very own map by recording your sonar logs into the memory card, uploading them into the Insight Genesis software, and loading the processed maps back into the fish finder. The resulting custom maps even include detailed vegetation, contours and bottom composition. The spacious 5-inch color display of the Elite 5X HDI offers a high 480 by 480 resolution complete with a convenient menu system that allows quick access to all features. There are several different display options available, as well as different charplotter configurations, sounder, and imaging screens. These views are pre-installed so you can cycle through them with one thumb. Included in the display are the live chart and sonar but you may also use a multi window when needed. Additionally, the fishfinder and chartplotter will let you adjust the overlay transparency for a fully-customizable viewing. Compared with the old fish finders that require confusing manual adjustments and tweaks, the Elite 5X HDI comes with the ASP (Advanced Signal Processing) technology that automatically adjusts the settings so you can see fish and bottom structure clearly. In case you missed something, you may jump back into the sonar history and see what was recorded using the Trackback feature. Waypoints can be created using a handy trackback location to eliminate the guesswork in locating previous fishing spots. Top it all off with a waterproof and compact design and you have a versatile tool that can go fishing with you anywhere, all day long. 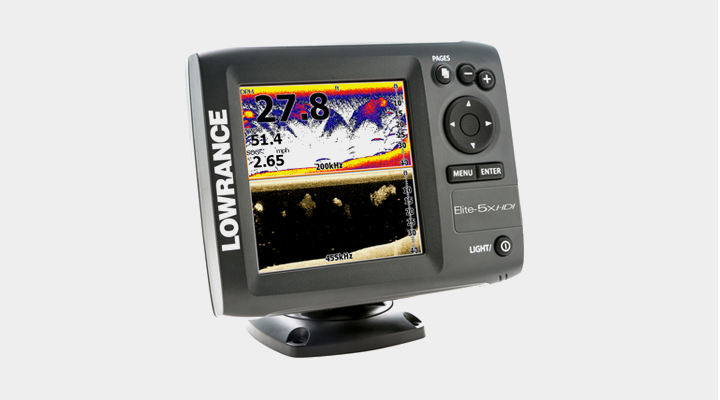 The Lowrance Elite 5X HDI Fishfinder and Chartplotter measures 2.5 by 6.9 by 5.4 inches (D x W x H) and weighs in at approximately 4 pounds. It is covered by the manufacturer’s 1-year limited warranty on parts and service. 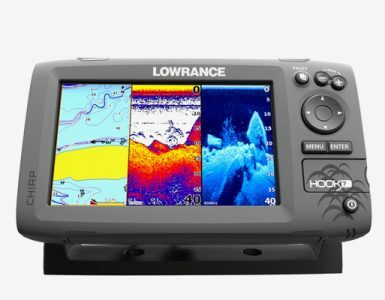 The color display on the Lowrance Elite5x HDI is so crisp and clear, you will love the detail it provides. It really does help you to establish what lies in the water beneath you and where you should be fishing. The Lowrance Elite5x HDI has some great features built into it and is a very easy device to both install and use.